Wishful Thinking joined our household when she was 4½ years old. 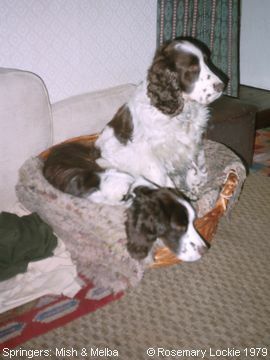 She was born in 1972, and raised as a show dog by Judith Hancock, of Hawkhill Kennels in Derbyshire, a famous breeder in the Springer world. Wishful's pet name in the kennels was “Wishy” but somehow I couldn't see myself going out at night calling “Wishy” for her to come in! So we changed it to “Mishy”, a soundalike which she accepted very quickly. Shortly after we got Mish, my mum also got a “second hand” model from the same kennels, called “Thelma”. My mum didn't like the name, so she became “Melba”!